Scientists have developed a new method to locate the precise time and location that objects fall into the oceans. The method, developed by researchers from Cardiff University, uses underwater microphones, also known as hydrophones, to listen for underwater sound waves that are emitted when an object hits the sea surface. They believe the new method could be used to locate meteorites, satellites or even parts of an aircraft that may have entered the ocean, and could also be used to locate underwater explosions, landslides or the epicentre of earthquakes far out at sea. 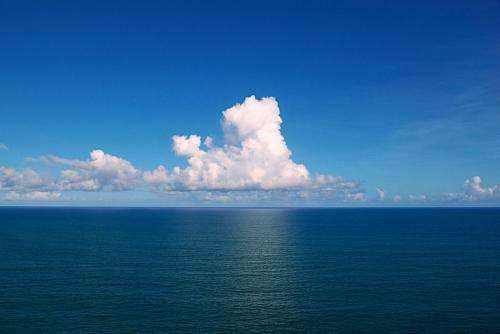 The new method, which has been presented in the journal Scientific Reports, relies on the measurement of acoustic gravity waves (AGWs) – naturally occurring sounds waves that move through the deep ocean at the speed of sound and can travel thousands of metres below the surface. AGWs can measure tens or even hundreds of kilometres in length and it is thought that certain lifeforms such as plankton, that are unable to swim against a current, rely on the waves to aid their movement, enhancing their ability to find food. When objects hit the sea surface they cause a sudden change in water pressure which leads to the generation of AGWs. In the first part of their study the team dropped 18 spheres onto the surface of a water tank, at varying distances and heights, and measured the subsequent AGWs that were emitted using a hydrophone. The team then analysed hours of data from hydrophones off the coast of Western Australia. These hydrophones are operated by the Comprehensive Nuclear-Test-Ban Treaty Organisation (CTBTO) for detecting underwater nuclear tests, but they can also pick up signals from AGWs. Using this data, the team were able to validate their method by successfully calculating the time and location of recent earthquakes that had occurred in the Indian Ocean. "By using existing detectors dotted all around our oceans and listening out for signatures from these deep ocean sound waves, we've uncovered a completely novel way of locating objects impacting on the sea surface," said lead author of the study Dr Usama Kadri, from Cardiff University's School of Mathematics. "Tracking these acoustic gravity waves opens up a huge range of possibilities, from locating falling meteorites to detecting landslides, snowslides, storm surges, tsunamis and rogue waves." The team also went one step further and analysed data from the same hydrophones from 18 March 2014 when the Malaysian Airlines Flight MH370 disappeared over the South Indian Ocean. Between 00:00 and 02:00 UTC when it is thought the plane disappeared, they found two "remarkably weak signals" around the suggested flight path of MH370, both resulting in a relatively large area of uncertainty where there may have been some sort of impact. "Our study was initially motivated by a desire to gain more knowledge about the incident involving flight MH370, using data analysis techniques that can pick up and locate much weaker signals," said co-author of the study Dr Davide Crivelli, from Cardiff University's School of Engineering. "Though we've located two points around the time of MH370's disappearance from an unknown source, we cannot say with any real certainty that these have any association with the aircraft. What we do know is that the hydrophones picked up remarkably weak signals at these locations and that the signals, according to our calculations, accounted for some sort of impact in the Indian Ocean. "All of this information has been passed onto the Australian Transport Safety Bureau and we anticipate that both now, and in the future, this new source of information could be used in conjunction with a whole of host of other data that is at the disposal of the authorities." This article piqued my interest as an infamous crank about fundamental gravity as unidirectional (no anti-gravity levitation possible). So, I was reading several articles on the subject and my take away is the term "acoustic gravity waves" is a bit of an ambitious misnomer. Gravity drags at the molecules of air and water. A measurable force that is an additional effect against heat-energized winds and waves. I wonder if tidal forces would cause or hinder additional effects? Bye the wayward. Has there been any study of how much the singular phenomena of planetary rotation effects the hydrosphere and atmosphere? "Drop a stone into a pool of water. The spreading ripples are gravity waves. The waves occur between any stable layers of fluids of different density. When the fluid boundary is disturbed, buoyancy forces try to restore the equilibrium. The fluid returns to its original shape, overshoots, and oscillations then set in which propagate as waves. Gravity or buoyancy is the restoring force hence the term - gravity waves." At first I thought that the mention of gravity waves with respect to acoustics was just a means of baiting by Phys.org to weed out the trolls, but then I realized, no, the "Gravitational" in AGW was a reference to the falling (due to gravity) of objects into the sea. Of course! Naturally, this is really just another way to smooth the ripples of the gravitational wave discussionion by generifying the word "gravity" so that it can be fit into any old hazy paradigm. You need to work on your realization process - because that's not what it is at all. It's important to use the correct words for the correct concepts. Yes, if the label "gravity wave" hadn't been taken for a hundred years or so then we would, possibly, be talking about gravity waves when talking about observations from black hole mergers. But since the label was already taken they had to use something else to avoid confusion.